Koofteh are Persian meatballs with many different variations, including lima beans or meatballs mixed with only rice, or in this case, a gorgeous mixture of rice, split peas and the most exciting part of the recipe, sabzi. Sabzi is a blend of dried herbs including leek, parsley, and tarragon, used by many Persian cooks. Instead of buying expensive fresh herbs in bulk, many Persian cooks use this dehydrated sabzi blend, which does the job beautifully. You can find it at many Mediterranean markets, though I have seen it online as well. I still have half a can left of “Sabzi Koufteh” in the cupboard, permeating the kitchen. Sabzi, meaning vegetable greens or herbs in Persian, comes in various blends for many different recipes. There is Sabzi Polo, which has dried dill and leek for rice dishes, and Sabzi Ghormeh, which is used in hearty stews. However, for these Persian meatballs, we will be using Sabzi Koufteh which is uniquely used for these gorgeous Persian meatballs. I couldn’t wait to make koofteh after my best friend gave me a huge can of the Sabzi Koufteh. My friend knows how much I adore Persian flavors, but I have to admit, this sabzi blend was a new adventure for me. The dried tarragon is captivating and gives the meatballs a very exotic aroma. Once everything is mixed together, and the saffron and onion are added, the meatballs take on a deeper flavor, something more special and lingering. With the fall harvest upon us, stews, soups and these Persian meatballs are what I crave. Koofteh will feed the whole family in one pot and most likely provide leftovers that taste even better the next day. These aromatic meatballs are blended with split peas, rice and herbs and are slowly stewed in a tomato turmeric broth that will have you begging for more. You don’t need to serve this with any more starch, but a nice helping of sautéed vegetables and lavash to soak up all that delicious broth would be perfect. 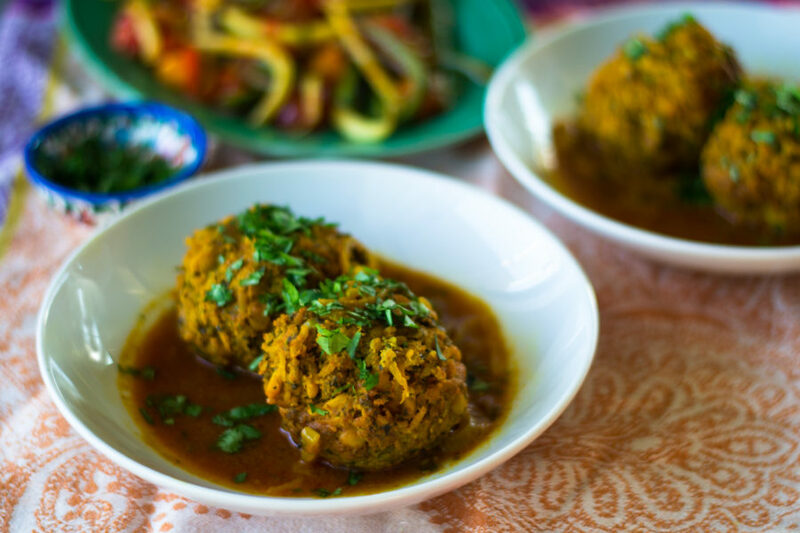 These Persian meatballs take a bit of planning but are so worth the effort. Make the mixture in the morning and allow the flavors to blend before forming them into meatballs. First soak the dried herbs in a bowl of water, enough to cover the herbs and allow to soak for about 20 minutes. If you haven’t already, cook both the rice and lentils (in separate pots) about half way. The basmati should take about 7-8 minutes and the split peas, about 10 minutes. Once done, drain and allow to cool to room temperature. In another large bowl, add the beef, grated onion, rehydrated herbs, egg, rice, split peas, turmeric, salt, and pepper, and mix thoroughly until well blended. Then cover with plastic wrap and place in refrigerator to marinate for at least 30 minutes. Once done, form mixture into large meatballs, it will make about 8 very large meatballs. In a large pot or dutch oven over medium heat, drizzle olive oil and add sliced onion and garlic and sauté until translucent. Then add turmeric and tomato paste and sauté for about 30 seconds. Next add the chicken stock and season with salt and pepper and stir everything together. This is a good time to taste the broth for seasoning before adding the meatballs. Then gently add the meatballs, cover and cook for about 45 minutes, turning them about halfway through. Once done, the sauce will have reduced. Serve with sautéed vegetables and garnish with fresh parsley. Classic shakshuka gets a dose of spiced lamb meatballs and fresh spinach for a one-pot wonder meal.